Can you swap the battery and cfast, without removing the camera from the DJI ronin S or is this not possible? (have none of them atm). I don't have the Ronin-S but I have the camera. I think the answer is going to be "yes" for the CFast card but "no" for the battery, unless you're using a long and heavy lens (something like the Sigma 18-35). That is... unless the Ronin-S can work with the motors on the left. 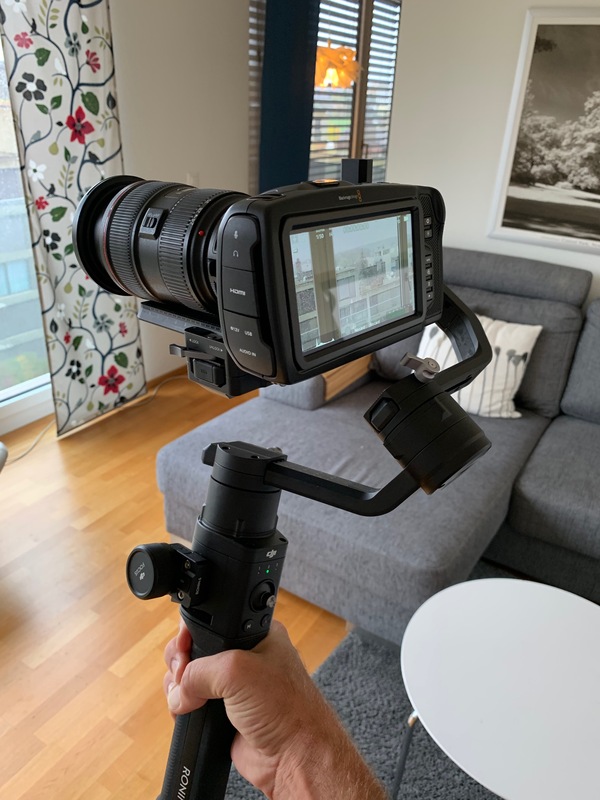 The plate mount should allow that, but I'm not sure if the firmware allows it or not (or, even better, if it can be configured so that it's the default and the gimbal directly wakes up in that configuration). edit: I asked for this here. Last edited by Samuel H; 10-29-2018 at 07:19 AM. Or maybe I could remove the batterydoor, tape a vmount onto the handle and use a DTAP to dummy battery. Not sure if there is room for a cable out. Last edited by polaroid22; 10-29-2018 at 06:54 AM. With the Sigma 18-35 you absolutely can. It's the perfect lens for the Pocket 4k and Ronin S combo. Zoom without changing balance. Open battery door and card door without obstruction. Not to mention super sharp and super fast. Yeah I own the sigma 18-35, only downside is I really hate that lens , I feel it is too sharp and has no character, I only use it for corporate stuff. So I wil prob end up using vintage Leica glass. I hear ya. I've tried some of my Canon FD and Leica R glass and unfortunately it obstructs the battery door and card door. Oh well, so be it. I just got my camera and was pleasantly surprised to see that the P4K mounts cleanly to the Ronin-S with my setup using SpeedboosterXL. The rig balances with a Canon 24-70 set at around 50mm, but the Ronin-S has zero issues stabilising this setup regardless of lens setting—like for instance 24mm. Since I use SBXL and Canon EF glass that is pretty heavy in comparison, the camera sits a bit to the back. But there is full clearance to move the handle over the camera if I would go from shoulder height to knee height. In this setup there is full access to CFast and battery. I tried setting my BMPCC4K up with a Ronin-S with a cage and a Rokinon Cine DS lens. I couldn't get the camera far enough to the right to counterbalance the weight of the cage and lens that are off center left on the camera. Shame, it means I will have to run it cageless on the Ronin-S, and get rid of the SSD and any wireless video+Follow Focus I wanted to use with cinema lenses. Panasonc 18-35mm it is without a remote focus or wireless video transmitting.